Jonas Maciulis erupted for a season-high 28 points to lead Panathinaikos Athens to a 73-79 victory over Alba Berlin at o2 World in the German capital. The Greens led for most of the game, though the hosts hung tough until the very end. 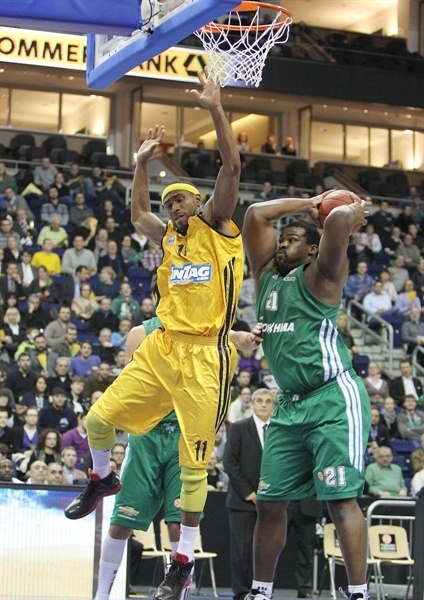 Panathinaikos improved to 3-1 and at worst one win out of first place in Group E, while Berlin remained winless. Most impressive about Maciulis’s tally was that he needed only 22 minutes and 10 shots to do so. Roko Ukic added 14 points and James Gist 10 for Panathinaikos, which was without star guard Dimitris Diamantidis due to injury. A big part of Alba staying in the game was its 17 offensive rebounds, but poor shooting overall doomed Coach Sasa Obradovic’s side. 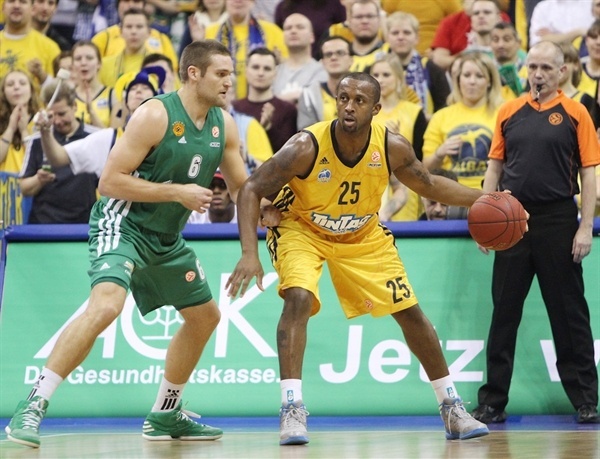 Nihad Djedovic led Alba with 21 points on 4-of-5 three-point shooting, while Deon Thompson netted 16 in defeat. Alba won the opening tip and struck first as Albert Miralles fed Thompson inside for a score. 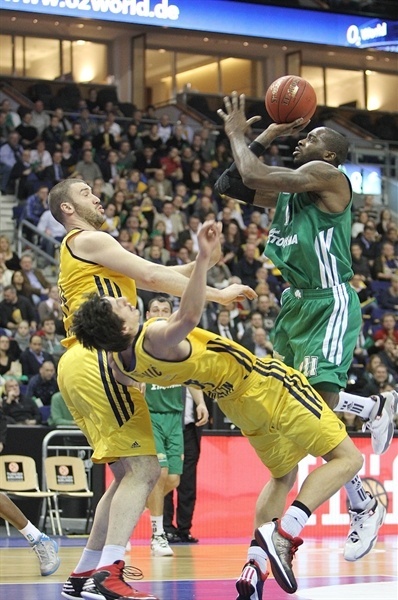 Gist buried a three-pointer for Panathinaikos’s first points. A strong of jumpers at both ends left the hoists up 6-5 before the game was stopped when Marcus Banks crashed into reporters after getting his layup blocked by Miralles. Thompson provided a highlight with a rebound and two-handed slam to cap a five-chance Berlin possession. A three-pointer by Maciulis left the visitors ahead 8-10 midway through the opening quarter. After the TV timeout, Maciulis knocked down another and then sank free throws to match the output of the entire Alba team to that point and to push his team to a 7-point edge. Thompson’s baseline jumper got the hosts going again. 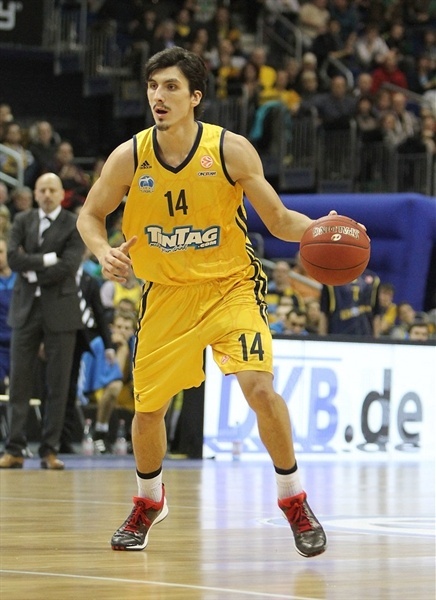 Djedovic fought his way into the game with the Ultimate Fantasy Play – offensive rebound, basket, foul drawn and made free throw. Maciulis remained the go-to guy for the Greens with 2 more free throws and a jumper, which gave him 14 points in eight minutes. However Djedovic countered with a long jumper and a triple. The tide turned against Maciulis when he committed an offensive foul. A triple by Heiko Shaffartzik tied the game at 21-21. 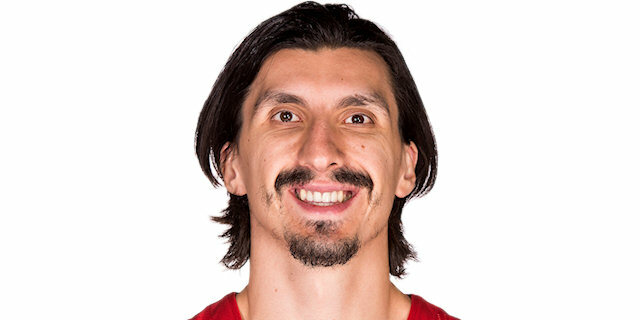 And Djedovic gave the hosts the lead from the line only to see Ukic finish a tough layup at the first-quarter buzzer to leave things square at 23-23. Sofoklis Schortsanitis came on for the second quarter and quickly made his presence known as he cleared space and then assisted to Ukic. Jason Kapono re-established a two-possession lead with a three from the corner, 25-30. Je’Kel Foster and Ukic traded threes before Kapono came off a pick and buried another jumper. Djedovic drilled his second three to bring the hosts within 33-35. 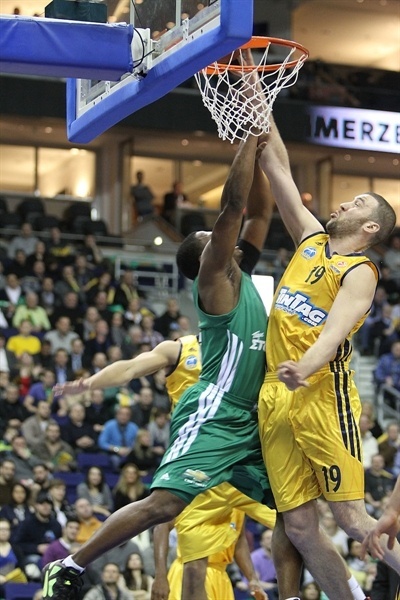 Thompson blocked Schortsanitis as the local fans started to roar. Gist denied Miralles a chance to tie the game at the rim. However a minute late DaShaun Wood banked in a floater to even things and then sank a second to complete a 9-0 run. Maciulis soon had the Greens back on top with his third three-pointer of the night and Gist dunked on a stunned Berlin defense to make it 37-41. Gist added free throws to complete a 0-8 Panathinaikos run. After Thompson free throws, a Maciulis tip-in made it 39-45 at the break. Zach Morley opened the second-half with a basket-plus-foul, but Banks made amends with his team for committing that foul by drilling a three-pointer. Byars scored a tough basket to give the hosts hope. 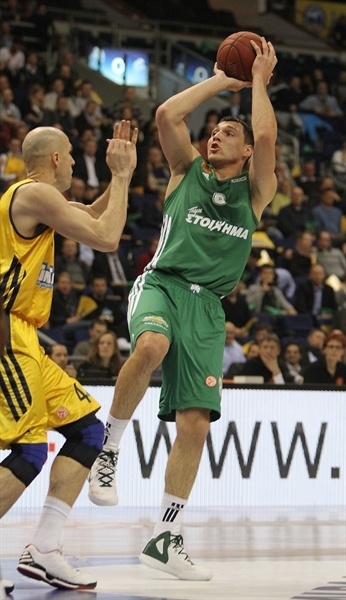 Kapono nailed a three-pointer, as Panathinaikos kept using long possessions to find open shots. Alba called timeout to adjust its defense, but the visitors kept moving away. Despite a Byars jumper, Big Sofo rose for a big slam and foul to make it 50-59. Stephane Lasme kept the Berlin attack stalled with a block on Byars. The hosts found a potential momentum swing when Maciulis committed an unsportsmanlike foul on Schaffartzik, after which Djedovic drilled a three and Morley helped force a turnover. Djedovic cut the gap to a single shot with 2 free throws. Maciulis came to the Panathinaikos rescue with back-to-back three-pointers from the exact same spot, which translated to a 56-65 lead at the end of the quarter. Ukic put the visitors up by double figures early in the quarter. Miralles ended a four-minute Berlin drought with a tip-in. Then Thompson finished a break with a layup-and-foul to fuel Alba’s hopes. 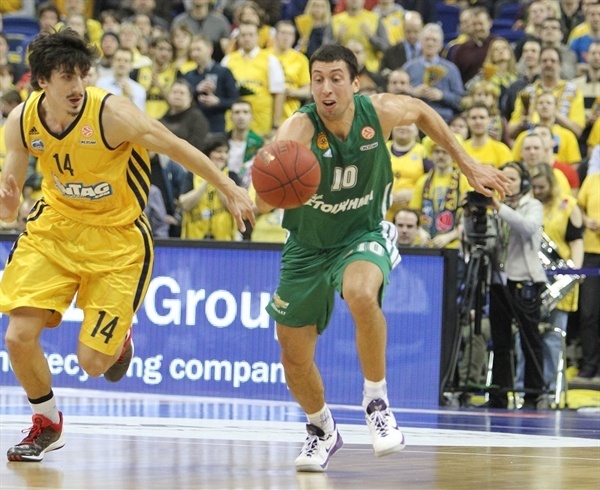 Djedovic’s fourth triple of the night made it 63-68 with five minutes to go as a chant started to roll through the o2. Then Thompson hit a tough baseline jumper and the crowd got louder. Gist took it upon himself to quiet the crowd with a three and Maciulis followed with a triple to make it 65-74. After a timeout, Schaffartzik hit a crucial three, but moments later missed a chance to get his team back to 3. 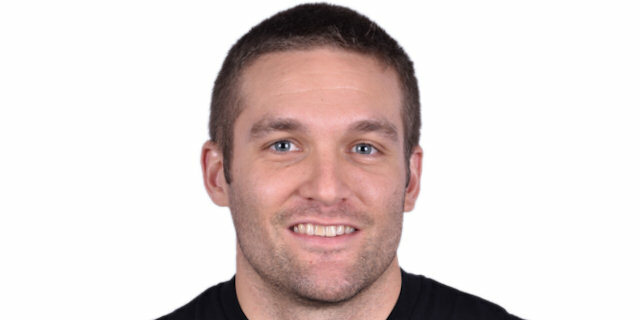 Mike Bramos came through with a big offensive rebound with 100 seconds remaining to help kill the clock. 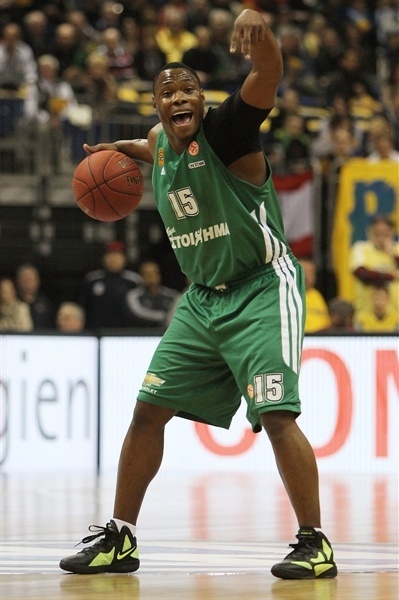 Banks added to the Panathinaikos lead from the line. Foster hit a deep three with just under a minute to play, 71-76. Then Morley made it a 4-point game with 31 seconds left. Banks made a pair of crucial free throws with 24 seconds to go. 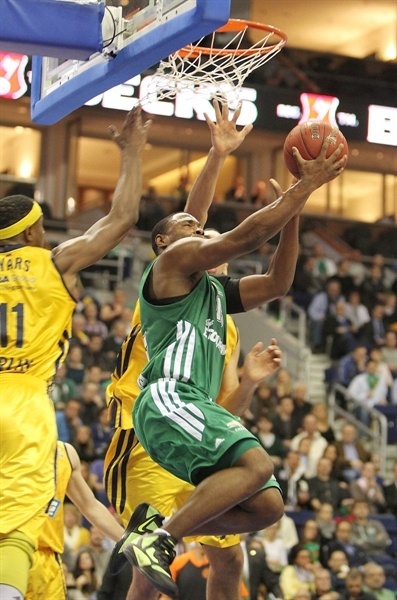 Berlin missed four times on its final possession and Panathinaikos went home with the victory. 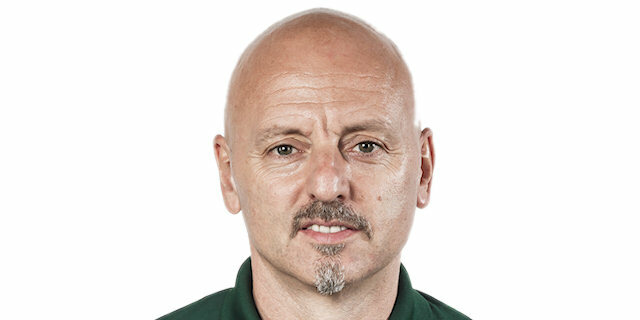 "Congrats to Panathinaikos for this deserved win. This game for us was the closest one in the Top16. That's why I have to say that my team is improving. I have no complaints. We played better than in the first games and fought until the end. But it is still not enough to face teams like Panathinaikos. To get out of such a game as a winner, still too many small things failed. Knowing when to shoot the ball, when to pass, when to go for a trap, when to foul. 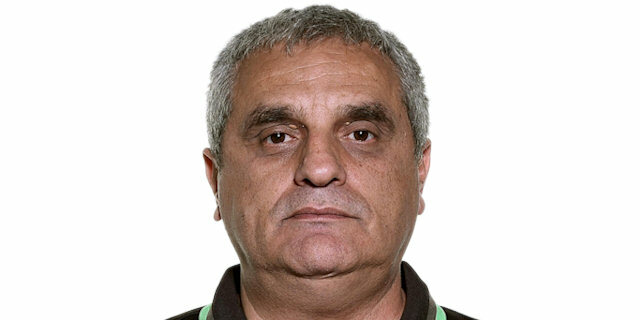 You saw that Panathinaikos knew these situations better. This really is a matter of experience and I am sure, that we will get stronger out of this." "Today was a game that we had to win in order to achieve our goal of qualifying for the next round. We have some new players, were missing others and therefore had some chemistry problems. But we solved these problems with our team defense, which was very good, especially after the first quarter, when we did not rebound well enough and made too many mistakes. We put the ball a lot in the low post, where Alba helped a lot. But when we passed the ball outside, we made our open shots. In the long run, when we will get back our missing players, we will get much better." "We fought with the right energy today and saw that we can compete even with a big team like Panathinaikos. But it is really tough against opponents like this. If you leave them alone for one minute, then you are down by 10. Nevertheless, I think these games are great for us. We can see where we are and where we have to improve and we will get better from this. " "Any time you win on the road, it is important, but this was an especially big win for us. Alba was a tough opponent. I think they will beat some opponents here at home in this group. Three-pointers were the main thing, Alba's defense gave us room tonight and therefore it was important that Jonas Maciulis got hot right from the beginning. That gave confidence to all the other players."